Impact-Resistant Gypsum Panels increase wall surface and core durability against damage. Impact-Resistant Gypsum Panel products are manufactured with a special high-density, mold- and moisture-resistant, Type X core laminated front and back with either heavyweight-paper facers or durable fiberglass mats. An additional reinforcing fiberglass mesh is embedded into the panel’s core near the back of the board to give it increased resistance to penetration. Long edges are wrapped with the facer material to give them added damage protection and tapered to make finishing easier while short edges are cut square. The dimensions of Impact-Resistant Gypsum Panels are typically 5/8” (15.9 mm) thick, 48” (1220 mm) wide and 8’ (2440 mm) to 12’ (3660 mm) long. Paper-faced panels are available with facer materials containing high percentages of recycled fiber and panel cores that include recycled gypsum content are increasingly common. The applicable product manufacturing standard is ASTM C1629. Impact-Resistant Gypsum Panels are a specialty application product designed to deliver specific wall protection properties in multi-family projects as well as a broad list of valuable additional features and benefits. o Construction Efficiency – Impact-Resistant Gypsum Panels make it easier and more cost efficient to construct interior walls capable of handling elevated levels of bumps, blows and abuse more efficiently than alternative building materials like masonry or engineered composite panels. Its installation simplicity, speed and lower initial cost help save design time, labor and cut time off the delivery schedule. In addition, adding, removing or remodeling walls and ceilings in the future is easier and less costly with Impact-Resistant Gypsum Panels. o Wall Performance – Impact-Resistant Gypsum Panels provide tested toughness against multiple forms of potential damage including surface wear and abrasions, minor indentations and both soft- and hard-body impacts. 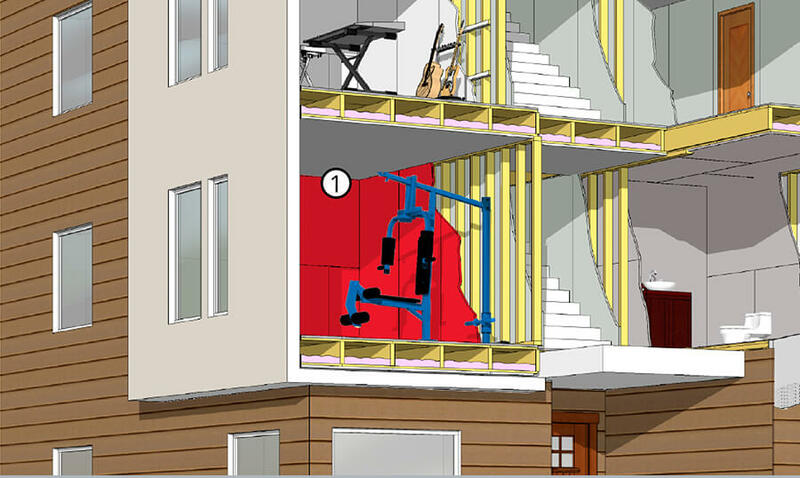 This makes an ideal option for wall construction in multi-family hallways, common areas and stairwells where the movement of people, furniture and belongings make surfaces more vulnerable to periodic collisions. o Maintenance Simplicity – When necessary, repairs to surface damage and even forceful impacts are easier to make with a gypsum panel product than other alternatives. Using common tools, techniques and basic carpentry skills, panels can be successfully repaired or replaced quickly and cost efficiently. o Mold and Moisture Protection – Impact-Resistant Gypsum Panels are tough against mold and moisture, too. Their core and facers are treated to resist water absorption and infiltration and their enhanced anti-microbial additives provide high tested levels of resistance to mold growth to help protect wall system integrity in multi-family, multi-unit structures. o Fire Resistance – Because Impact-Resistant Gypsum Panels are made with a non-combustible Type X core and are UL-classified for use in any fire-rated assembly where a 5/8” Type X panel is approved, they can be a key component in the fire-protection strategy of multi-family developments. Refer to GA-600 Fire Resistance and Sound Control Design Manual. Consult with gypsum manufacturer for specific recommendations. To provide a way of comparing the expected performance of different brands of Impact-Resistant Gypsum Panels, laboratory tests are conducted in accordance to ASTM C1629 to simulate typical wear that might be experienced in a multi-family application. Product samples are exposed to four different potentially damaging forces on specially designed test equipment and ranked into one of three different classifications based on the degree of damage each sample sustains.